The Gruffalo is one of Dot’s favourite read aloud books and as of now this is the most borrowed book from the community library. When we first borrowed this book for Dot when she was about two years old and I was pleasantly surprised that she could sit through the whole reading as this book is rather wordy for a two year old. She even asked me to read to her again. Maybe it is the beautiful illustration that kept her attention. I also happened to find the Gruffalo DVD in our library and borrowed it. Dot really enjoyed watching The Gruffalo animation and she watched this short film many times. This further reinforced her understanding of this story. A few weeks ago, we went to the library and she saw The Gruffalo books again – the original and an adapted version – and asked me to borrow them for her again. As we have borrowed the original version of Gruffalo several times and read aloud to her many times, she can now recite and read out some of the words and short phrases on her own. That’s the power of repetition! 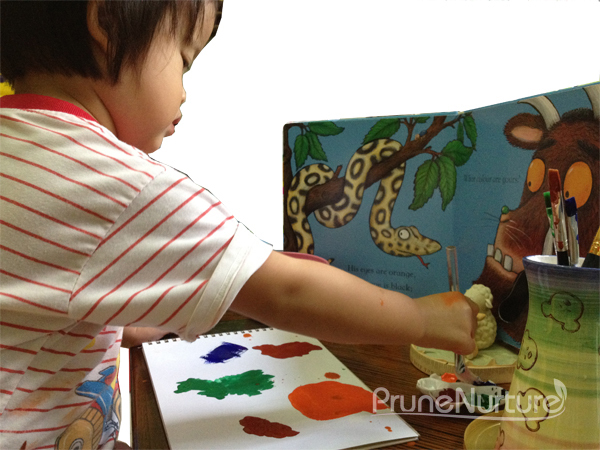 One day, Dot decided that she wanted to paint Gruffalo and she did, though the final artwork she did was no where near how Gruffalo should look like. 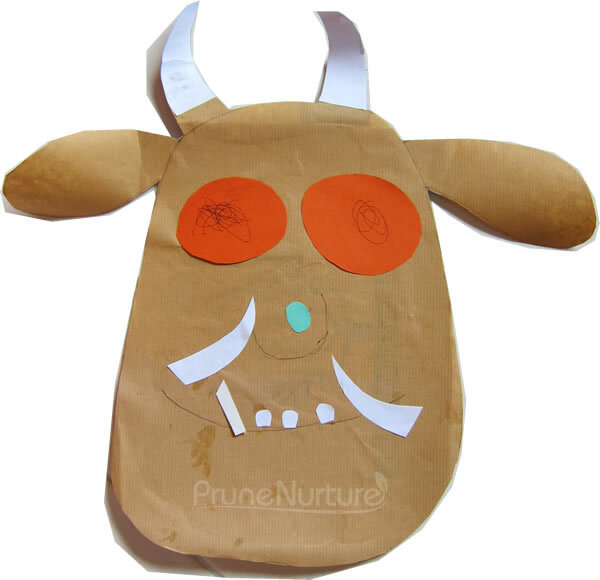 I thought I should find some Gruffalo-themed crafts and activities for her. 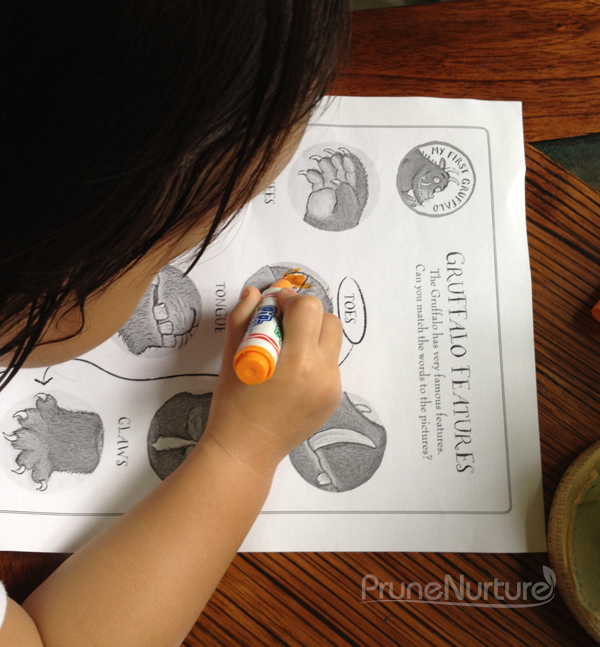 I downloaded a Gruffalo’s features printable that has the images and features of Gruffalo. Dot colored the eyes of the Gruffalo. When I named each feature, she would point to the correct image. I drew and cut out the outline of the face of the Gruffalo and the various features for Dot to paste. She drew the “dizzy” eyes and pasted a fall-out tooth! Haha! This was our Gruffalo’s face. A time to act out the story will be fun so I printed Gruffalo and friends finger puppets where Dot and I coloured, named and cut each character. I did most of the work for this activity. Though this craft is called finger puppets, I pasted tapes over chopsticks to hold each character instead. After that we went to a dark room to do a light and shadow activity like what we did previously. I narrated the whole story while Dot took the appropriate characters to act out the scenes. We had so much fun together. Which creature is the biggest? Which creature is the smallest? What does the owl eat? What does the fox eat? What does the snake eat? What does the mouse eat? 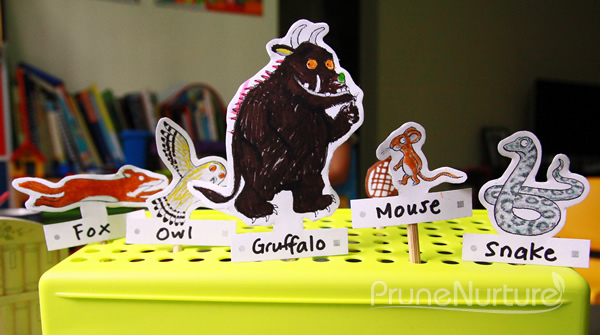 Where do the Gruffalo, the mouse, the fox, the owl and the snake live? I should do a Gruffalo themed trekking with Dot in the deep dark wood when the weather and time permit. We will explore what flora and fauna live in the deep dark wood.